Fleas have compressed, flattened bodies with overlapping toughened plates and long, well developed hind legs for jumping. Flea eggs are 0.5mm long and pearly-coloured. They are laid in carpets, between floorboards, on fur, bedding and on clothing. They usually hatch in 2–3 days. Flea larvae are whitish and up to 5mm long. They thrive best in dark humid places; such as underneath furniture. After 2–3 moults these are fully grown in 3–4 weeks. Flea pupae: cocoons incorporating debris to feed from are spun by the larva. The development time is dependent on the temperature. Their emergence is in response to vibration. Once emerged from the flimsy cocoon, adult fleas rapidly find a host for their first blood meal. Adults fleas can survive several weeks without a blood meal, they usually feed on the blood of the species to which they are adapted but will feed on other animals in the absence of the normal host. 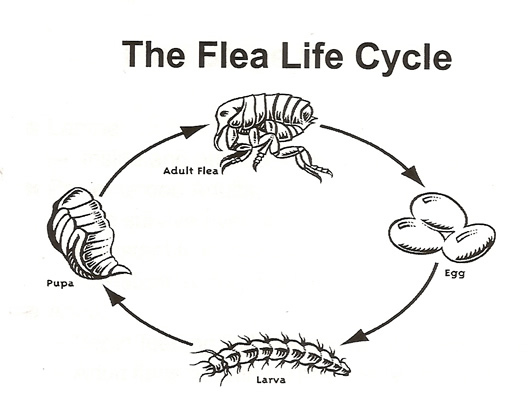 While the flea larvae thrive in dark, humid places such as animal bedding and carpet fluff, and feed on organic debris and adult flea excrement. Living on our pets and irritating humans source of blood is valuable part of the flea’s diet. 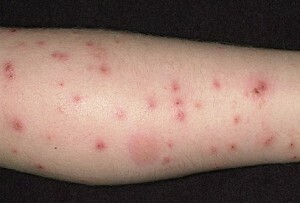 Fleas feed off the blood of humans and animals such as dogs and cats. A flea bite is intensely itchy and secondary infections are common. Treatment options include anesthetic creams and icepacks to reduce the swelling. Fleas can transmit disease including tapeworm larvae and murine typhus. Fleas can also transmit bubonic plague from animals to humans in some parts of the world.